Hello there, beautiful gluten free vegan carrot cake! Layers of moist, spiced carrot cake and decadent cream cheese frosting, a combination that’s hard to resist. There are a lot of different variations out there when it comes to carrot cake. Some recipes call for raisins, others have either walnuts or pecans in the recipe. I’ve seen some that add shredded coconut or even crushed pineapple to the batter. I don’t know about you, but I like the simplicity of carrot cake with just shredded carrots and a few warm spices. Simple and sweet. Let’s talk about this cake. See those layers? 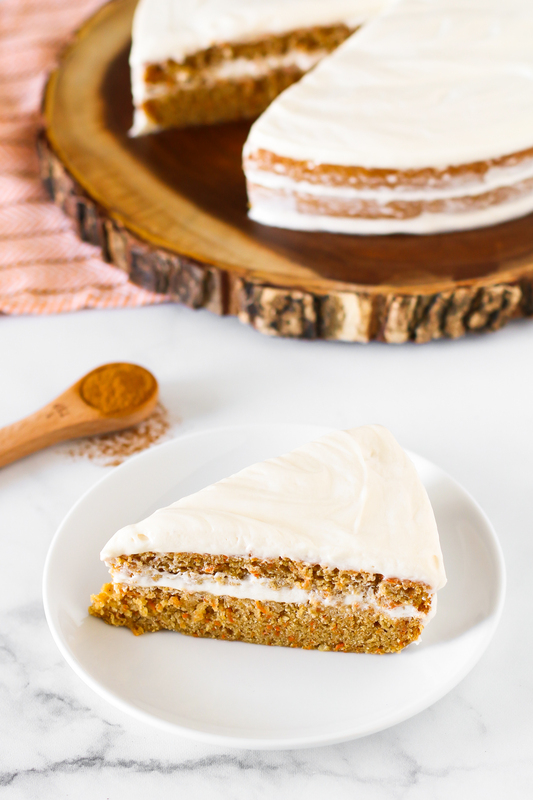 The carrot cake layers are so moist and flavorful, you will never guess the cake is made without gluten, dairy or eggs. It’s magical, I tell ya! I think the combination of the cinnamon, ginger and cardamon with the sweetness from the shredded carrots is pretty great. So warm and comforting. 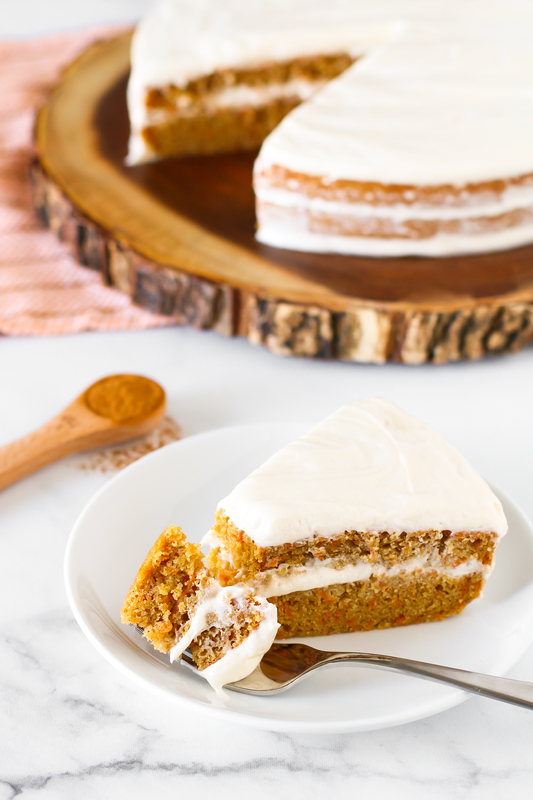 The cream cheese frosting is a total must in this gluten free vegan carrot cake recipe! It’s made with dairy free cream cheese, as well as dairy free butter. The richness of the frosting compliments the carrot cake so beautifully. I decided to bake a single layer of cake in a 10-inch cake pan, then sliced into two layers before frosting. You could certainly skip this step and just frost a single layer cake if you’d like. Both are great options, I just love the look of the layered cake with that luscious cream cheese frosting. 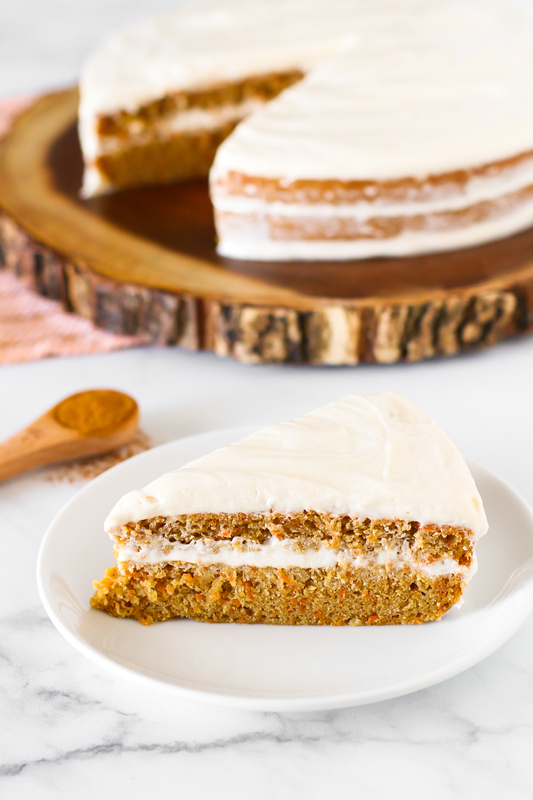 Do you like to add a few mix-ins to your carrot cake? Even though I didn’t add nuts or raisins to this recipe, you could certainly add either or both to the batter. It would also be pretty to sprinkle on some toasted pecans over the top or sides of the cake once it’s frosted. Go for it, get creative with your carrot cake! Preheat oven to 350 degrees. Spray 9-inch or 10-inch cake pan with cooking spray and line bottom with parchment paper. In large mixing bowl, whisk together flour blend, sugar, brown sugar, cinnamon, ginger, cardamon, baking powder, baking soda and salt. Set aside. In medium bowl, stir together yogurt, almond milk, oil, vinegar and vanilla extract. Add shredded carrots and mix well. Pour wet ingredients into bowl with dry ingredients. Stir until cake batter is smooth and is well combined. Pour into prepared cake pan and smooth out batter. Bake cake 35-40 minutes, until toothpick inserted into center of cake comes out clean. Cool cake in pan on cooling rack 10 minutes. Invert onto cooling rack to cool completely. When cake is cooled, use sharp serrated knife to divide cake into two layers. You can also leave the cake as a single layer cake and skip this step. To make frosting, cream together cream cheese and butter in mixing bowl. Add powered sugar and vanilla extract. Cream together until smooth, 1-2 minutes. Place frosting in fridge to chill for about 20 minutes, making it easier to frost cake. Place the bottom cake layer on cake plate. Frost the top of the cake and top with second cake layer. Place in fridge to chill before frosting top and sides of cake, 15-20 minutes. Frost the top and the sides of the cake with remaining frosting, using offset spatula. Store cake in fridge. Slice and serve. 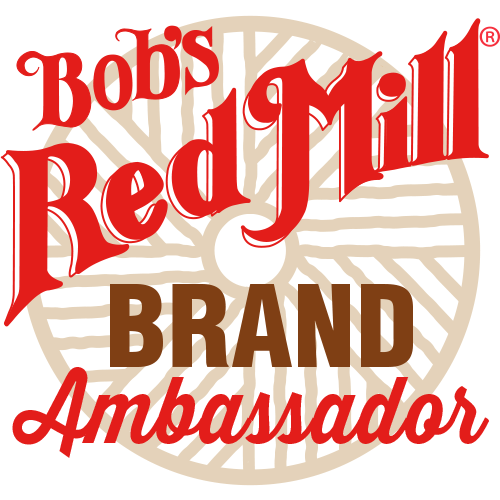 *A great alternative to my flour blend is the Bob’s Red Mill Gluten Free 1-to-1 Baking Flour.